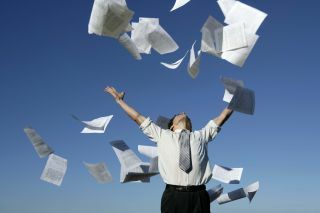 Going paperless - it's good for the trees, good for budgets, increases efficiency and organization, and makes life easier in many ways. But how do you go paperless? I used to use paper planners (Franklin Quest) until I got my first PDA (Palm IIIxe) in 2000. I also try to go paperless in as many other ways as possible. The first thing you need is electronics. You need to have ready access to a computer, tablet and/or smartphone. If you don't have paper, you need to be able to check your electronic data whenever you need too. A smartphone is one of the best tools to go paperless. You can access your calendar, notes, to do list, files and pretty much everything else. I use an Android smartphone and it makes my life so efficient and easy. Another piece of hardware is a scanner, especially one that has document feed capabilities (vs. a flatbed scanner). With this, you can digitize all the paper you already have for easy access and storage. I even scan in student work for easy access at home to grade it and to keep and e-portfolio for the students. Apps and software are the next piece of the paperless puzzle. You need to have a calendar, notes, to do list, access to your other files, and apps to read all your files. I use Google's products for calendar, task list, contacts, documents, email, blogs and web sites, and more. I use Evernote for notes (other notes apps) and also have scanned documents and other files uploaded to my Evernote notebooks. I use Dropbox and Sugarsync to back up all of my files and access them at any time, from my smartphone or any web enabled device. Once you have your services and apps set up, you can access your files and data anywhere. You can get more organized, keep your data together, stay on schedule and more. You don't have to carry things around with you either. You can do almost everything online now, including banking. Bills and paperwork can be sent electronically instead of paper, and you can get digital magazines instead of print. If you don't have ready access to a mobile device, but spend most of your time near a computer, you can always print out your calendar/schedule for the week, along with your to do list and space for notes. 1 page of paper or so per week is better than tons of paper. If you like taking notes with a pen and paper, take a look at the LiveScribe smartpen. You write on the special paper (buy it or print it out) and the pen stores what you write. It also has a voice recorder. It then syncs your notes to your computer and makes them digital and accessible anywhere. You can even share your notes via email and Evernote, along with some other services. Going paperless is, in my opinion, a great way to get organized, help the environment, save money (after the initial hardware purchase, all the apps are free), save your back, and be more efficient.